But, the news gets even better. 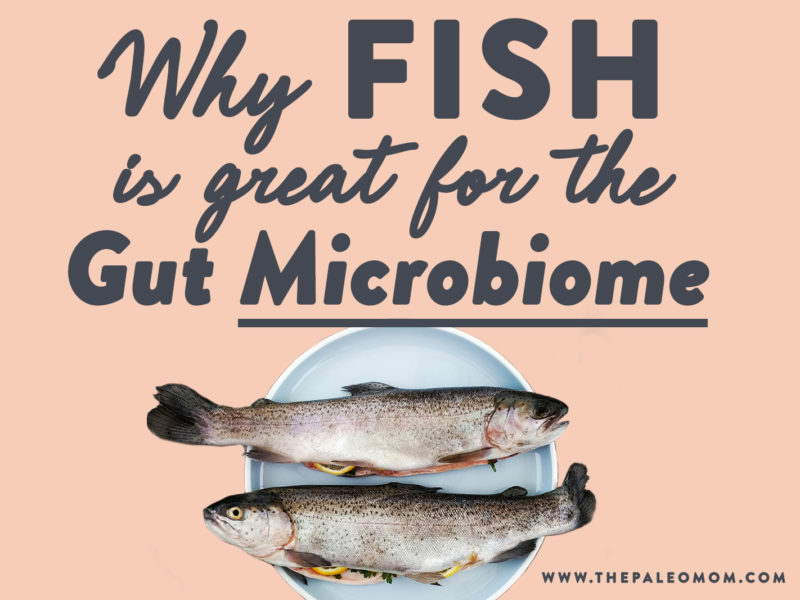 It turns out fish is one of the best foods we can eat for yet another critical component of our health: the gut microbiota, AKA the massive, metabolically active collection of microorganisms inhabiting our GI tract (see What Is the Gut Microbiome? And Why Should We Care About It?). 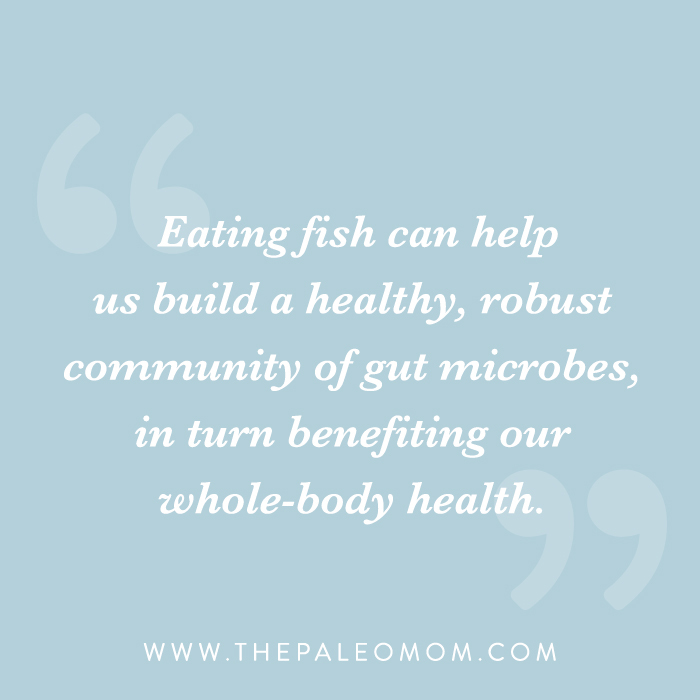 Research overwhelmingly shows that eating fish can help us build a healthy, robust community of gut microbes, in turn benefiting our whole-body health. Let’s take a look at the many ways fish is a great catch for our gut! The omega-3 fatty acid content of fish remains its biggest claim to fame, and when it comes to the gut, this special fat continues to deliver! In fact, many of the benefits attributed to omega-3 fats on human health are mediated by the gut microbiome. Research in both mice and humans has shown that omega-3 supplementation increases levels of the well-studied probiotic bacteria Bifidobacterium and Lactobacillus, and also enhances the abundance of butyrate-producing bacteria (butyrate is an extremely important short-chain fat that improves gut barrier integrity, protects against colorectal cancer, and feeds intestinal epithelial cells). Likewise, higher omega-3 levels in the body (reflecting higher consumption) have been linked to more microbial diversity in the gut, which is one of the hallmarks of a healthy microbiome. Omega-3 fats also appear capable of reversing the dysbiosis associated with irritable bowel disease, and their anti-inflammatory effects can benefit other disorders involving inflammation of the gut. During pregnancy, omega-3s from fish could even influence the offspring’s health through gut-mediated mechanisms (see also Paleo for Pregnancy and Lactation)! That includes obesity risk and cognitive-behavioral issues. 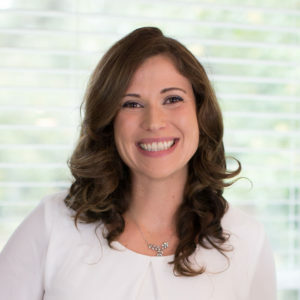 In one study using wild-type mice vs. mice that genetically produce high levels of omega-3 fats, the ratio of omega-3 to omega-6 fatty acids in a mother’s body during pregnancy and breastfeeding influenced the balance of gut microflora in her offspring, with lower omega-3s leading to indicators of metabolic disruption and resulting in significantly more weight gain. Another mouse study found that higher levels of tissue omega-3s helped prevent gut dysbiosis induced by early exposure to antibiotics, while also protecting against obesity, insulin resistance, fatty liver, and dyslipidemia later in life. Yet another study in mice demonstrated that omega-3 supplementation in utero and during early childhood altered the development of the microbiota hand-in-hand with adolescent and adulthood improvements in cognition, anxious and depressive-like behavior, and sociability. Although it will be worthwhile to conduct more studies in humans looking at the interaction between maternal omega-3 intake and the gut microbiota, the research we have so far is a strong endorsement for not avoiding fish during pregnancy! 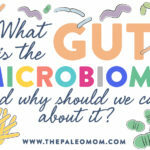 t might come as a surprise that different food sources of protein can have wildly different effects on the gut microbiota, but this is exactly what the science bears out! 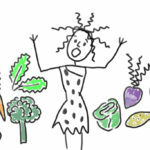 In fact, scientists have been aware of the effects of dietary protein on the gut microbiome since at least 1977, when a culture-based study found that diets high in beef protein lead to distinct differences in microbiome composition compared to meat-free diets (in particular, the high beef protein diet was associated with lower levels of Bifidobacterium adolescentis and higher levels of Bacteroides and Clostridia). Since that discovery, data has continued to mount demonstrating the ways that different types and quantities of protein influence our gut health—as well as how our guts influence protein availability! Typically, about 10% of the protein we eat doesn’t get absorbed and instead is processed by our gut bacteria. This protein (in addition to human proteins that our gut bacteria metabolize, including sloughed off intestinal epithelial cells [after they’ve gone through their normal life cycle], mucin [the protein produced by M cells in the gut that is a major component of mucus, which lines the entire small and large intestine] and even our digestive enzymes) is essential for the growth and survival of the bacteria in our digestive tracks. Amino acids are utilized for the synthesis of bacterial cell components or catabolized (broken apart) through different pathways. Certain amino acids have been identified as likely essential for optimal growth of gut bacteria, including arginine, aspartate, asparagine, glutamate, glutamine, glycine, lycine, serine, threonine, and the branched-chain amino acids (leucine, isoleucine, and valine). 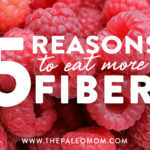 Yes, while fiber gets most of the credit for supporting gut bacteria health (see The Fiber Manifesto-Part 1 of 5: What Is Fiber and Why Is it Good? ), protein is also an essential factor! And, among the animal proteins, fish protein offers some distinctive benefits for the residents of our gut. In a rat study analyzing several food proteins (fishmeal, soy protein, and casein from milk), the fish protein boosted levels of butyrate, indicating a shift towards higher production of this important metabolite. In another study, researchers fed mice 12-week-long diets containing protein from lean seafood (a combination of fish and shellfish) or lean meats (a mixture of chicken, pork, and beef). This study found that not only was the seafood diet less obesity-producing, it also supported higher levels of helpful members from Bacteroidales and Clostridiales. And yet another study comparing protein from fish, chicken, casein, soy, pork, and beef found that the fish protein (along with chicken protein) led to a greater abundance of beneficial Lactobacillus species than the other proteins. Fiber isn’t a word we usually associate with seafood (or any animal foods, for that matter! ), but when we eat small fish that still have their scales still present (think: sardines and anchovies), we’re actually ingesting some fiber. The reason? Fish scales contain chitin, a unique form of fiber made from modified glucose (and which is also present in mushrooms and the exoskeletons of insects!). See also The Fiber Manifesto-Part 2 of 5: The Many Types of Fiber. Chitin, it turns out, is a pretty awesome prebiotic. 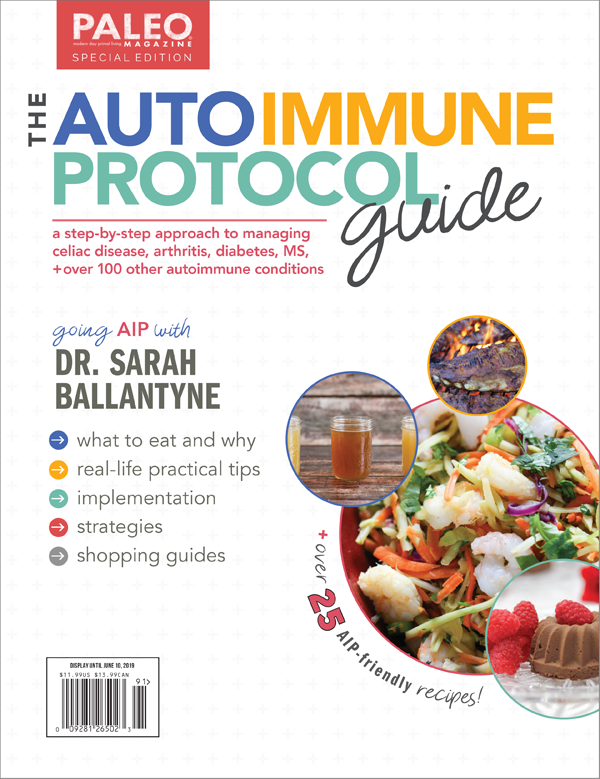 It’s been shown to support the growth of a variety of gut-friendly bacteria, including Bifidobacterium, Lactobacillus, Akkermansia, and Bacteroides, while also decreasing the abundance of the inflammatory microbe Desulfovibrio (which has been found in relatively high concentrations in people with inflammatory bowel disease). And, in mice, chitin oligosaccharides (produced from chitin digestion) have been shown to modulate the gut microbiota to combat diet-induced metabolic syndrome, while also inhibiting the destruction of the gut barrier, restoring the Firmicutes to Bacteroidetes ratio to what it was before the high-fat feeding, and also reversing decreases in beneficial bacteria. 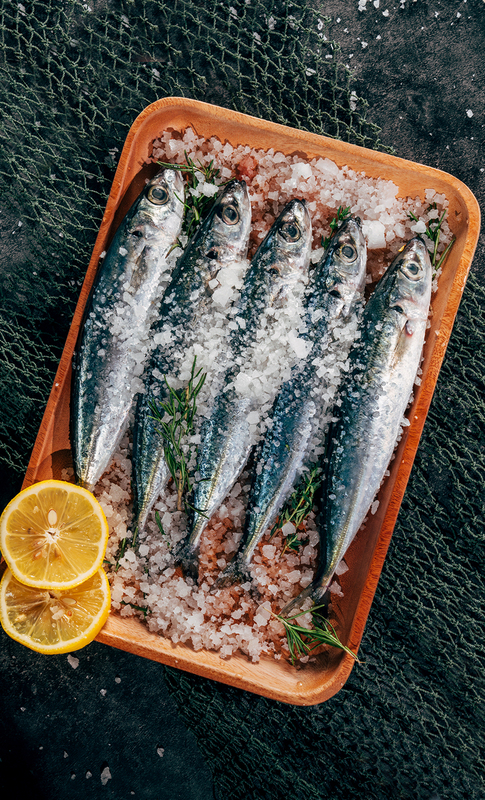 So, all the more reason to add whole, small, skin-on fish like sardines and anchovies to our diet (the extra micronutrients from their bones and organs is a big plus, too!). 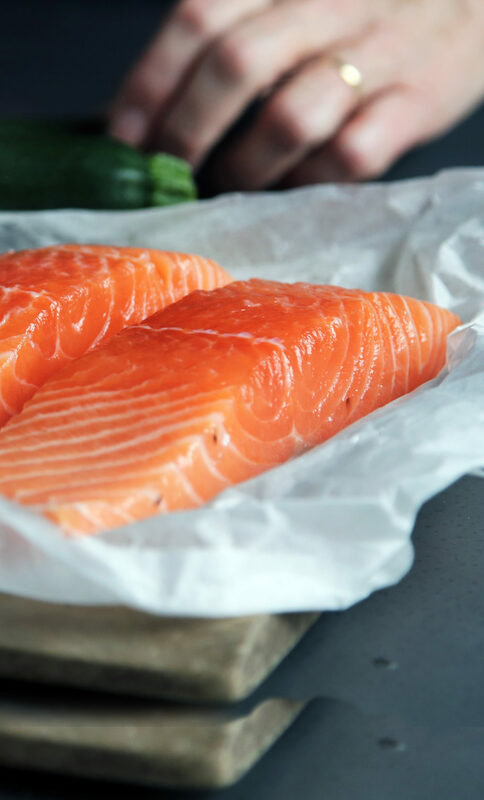 Fatty fish (like salmon, mackerel, and tuna) is one of the very few sources of dietary vitamin D in our modern food supply, and this nutrient plays a fascinating and complex role in maintaining a healthy gut! We already know that vitamin D enhances gut barrier function and protects against leaky gut (for example, by enhancing the intercellular junctions that control gut permeability, and by reducing inflammatory cytokines like interleukin-8). But, many roles of vitamin D (and diseases associated with vitamin D deficiency) are actually mediated through our gut microbes themselves! In people with multiple sclerosis, high levels of serum vitamin D (above 40 ng/mL) are associated with greater levels of Ruminococcaceae, a bacterial family that produces short-chain fatty acids and may help protect against MS-related inflammation. Researchers have also hypothesized that for patients with cystic fibrosis, vitamin D may help manipulate the gut mucosa in ways that reduce gut inflammation and allow beneficial bacteria to out-compete opportunistic pathogens, in turn lessening some symptoms. One study found that vitamin D supplementation (at a dose of 980 IU per kg bodyweight per week for four weeks, followed by another four weeks of taking 490 IU per kg of bodyweight) significantly reduced levels of Gammaproteobacteria, including the most common opportunistic pathogens, while also increasing the bacterial richness of the gut microbiota. And, in case we need another reason to keep our vitamin D levels in a healthy range, here it is: research shows vitamin D deficiency may contribute to metabolic syndrome via the gut! Vitamin D deficiency has been shown to aggravate imbalances in the microflora, including by decreasing the production of defensins (anti-microbial molecules needed for maintaining healthy gut microbes). These imbalances lead to fatty liver disease, elevated blood sugar, and other signature features of metabolic syndrome. 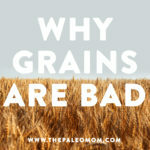 See also Paleo for Weight Loss and The Paleo Diet for Cardiovascular Disease. Finally, the link between vitamin D and the gut microbiome may actually be a two-way street. While vitamin D can impact the health and composition of the gut microbiota, certain bacteria in the gut may also influence vitamin D levels in the blood by regulating vitamin D metabolism. In humans, higher levels of Coprococcus and Bifidobacterium, for instance, appear to promote higher vitamin D levels, though more studies are needed to determine cause and effect. So, there we have it! 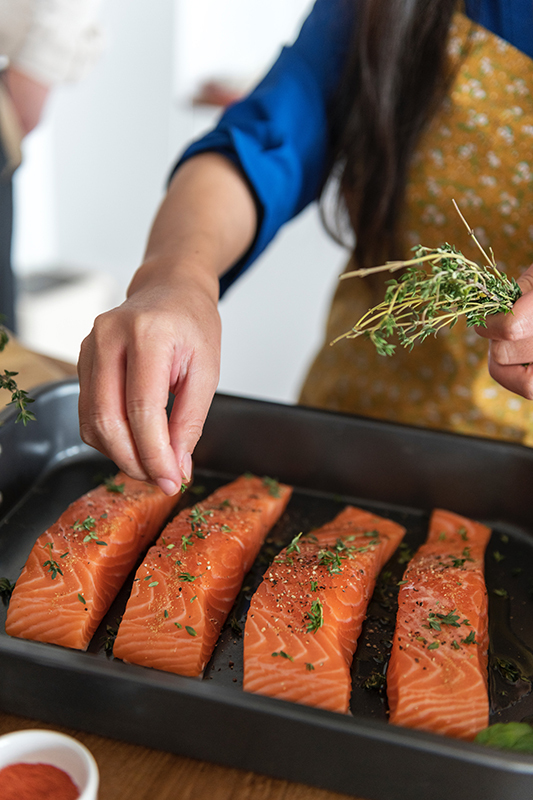 Not only is fish delicious and nutrient-dense; it also contains multiple components that directly benefit our gut microbiota and consequently, our disease risk and wellbeing. And as with most things in our diet, the greater the diversity, the better! 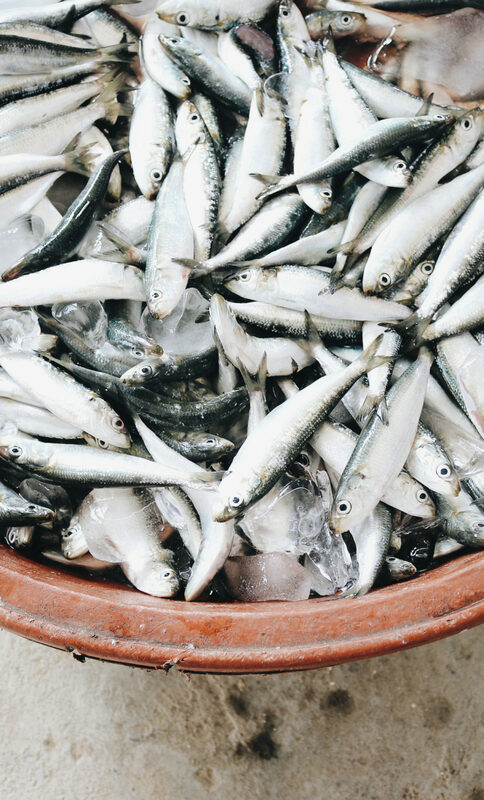 Fatty fish (rich in omega-3s and vitamin D), lean fish (rich in protein), and small, scales-on fish (providing chitin) all provide different nutrients that support our microbial health. Surf’s up! An C, et al. “Caecal fermentation, putrefaction and microbiotas in rats fed milk casein, soy protein or fish meal.” Appl Microbiol Biotechnol. 2014 Mar;98(6):2779-87. doi: 10.1007/s00253-013-5271-5. Epub 2013 Oct 10. Bora SA, et al. “The Gut Microbiota Regulates Endocrine Vitamin D Metabolism through Fibroblast Growth Factor 23.” Front Immunol. 2018 Mar 2;9:408. doi: 10.3389/fimmu.2018.00408. eCollection 2018. Costantini L, et al. “Impact of Omega-3 Fatty Acids on the Gut Microbiota.” Int J Mol Sci. 2017 Dec 7;18(12). pii: E2645. doi: 10.3390/ijms18122645. Gominak SC. “Vitamin D deficiency changes the intestinal microbiome reducing B vitamin production in the gut. The resulting lack of pantothenic acid adversely affects the immune system, producing a “pro-inflammatory” state associated with atherosclerosis and autoimmunity.” Med Hypotheses. 2016 Sep;94:103-7. doi: 10.1016/j.mehy.2016.07.007. Epub 2016 Jul 14. Holm JB, et al. “Diet-induced obesity, energy metabolism and gut microbiota in C57BL/6J mice fed Western diets based on lean seafood or lean meat mixtures.” J Nutr Biochem. 2016 May;31:127-36. doi: 10.1016/j.jnutbio.2015.12.017. Epub 2016 Feb 2. Loubinoux J, et al. “Sulfate-reducing bacteria in human feces and their association with inflammatory bowel diseases.” FEMS Microbiol Ecol. 2002 May 1;40(2):107-12. doi: 10.1111/j.1574-6941.2002.tb00942.x. Robertson RC, et al. “Maternal omega-3 fatty acids regulate offspring obesity through persistent modulation of gut microbiota.” Microbiome. 2018 May 24;6(1):95. doi: 10.1186/s40168-018-0476-6. Su D, et al. “Vitamin D Signaling through Induction of Paneth Cell Defensins Maintains Gut Microbiota and Improves Metabolic Disorders and Hepatic Steatosis in Animal Models.” Front Physiol. 2016 Nov 15;7:498. eCollection 2016. Tabatabaeizadeh SA, et al. “Vitamin D, the gut microbiome and inflammatory bowel disease.” J Res Med Sci. 2018 Aug 23;23:75. doi: 10.4103/jrms.JRMS_606_17. eCollection 2018. Tang WJ, et al. “Chitin is endogenously produced in vertebrates.” Curr Biol. 2015 Mar 30;25(7):897-900. doi: 10.1016/j.cub.2015.01.058. Epub 2015 Mar 12. Waterhouse M, et al. “Vitamin D and the gut microbiome: a systematic review of in vivo studies.” Eur J Nutr. 2018 Oct 15. doi: 10.1007/s00394-018-1842-7. Watson H, et al. “A randomised trial of the effect of omega-3 polyunsaturated fatty acid supplements on the human intestinal microbiota.” Gut. 2018 Nov;67(11):1974-1983. doi: 10.1136/gutjnl-2017-314968. Epub 2017 Sep 26. Zheng J, et al. “Chitin Oligosaccharide Modulates Gut Microbiota and Attenuates High-Fat-Diet-Induced Metabolic Syndrome in Mice.” Mar Drugs. 2018 Feb 19;16(2). pii: E66. doi: 10.3390/md16020066. Zhu Y, et al. “Meat, dairy and plant proteins alter bacterial composition of rat gut bacteria.” Sci Rep. 2015 Oct 14;5:15220. doi: 10.1038/srep15220. 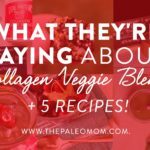 Previous Post: « TPV Podcast Episode 337: What’s the Deal With Celery Juice?